Detail from cover of New Zealand Security Magazine, Dec 2018 - Jan 2019. Welcome to the December 2018 – January 2019 issue of New Zealand Security Magazine. This issue we are proud to present an exclusive interview with internationally renowned aviation security expert, Philip Baum. Editor of Aviation Security International, visiting professor of aviation security at Coventry University, and managing director of security consultancy Green Light Limited, Philip is a leading figure in behavioural analysis. Traditionally a surveillance methodology developed for the aviation and border security sector, behavioural analysis, or behaviour detection, is increasingly viewed as a fit-for-purpose tool in broader physical security applications – and particularly in venue and crowded places security and counter terrorism. It’s a topic we’ve been following in recent issues of NZSM, and will continue to seek thought leadership on in 2019. In another exclusive interview, we are joined by Hikvision’s director of cybersecurity, Chuck Davis, an SIA Cybersecurity Advisory Board member, adjunct professor of computer science and ethical hacking at the University of Denver, and two-decade cybersecurity veteran. Amid sensationalist media allegations of back-door vulnerabilities and Chinese government snooping, we get the inside scoop on where Hikvision sits in the cybersecurity continuum. 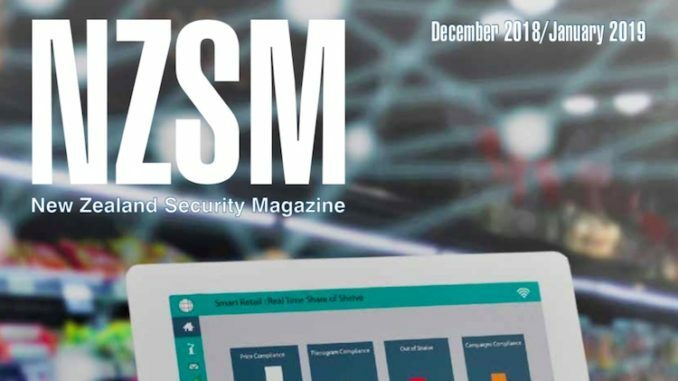 Retail security is typically a strong theme in our December edition, and in this issue we feature recent retail trend reporting from KPMG and ACI Worldwide. We also review a recently published research into shopper perceptions of safety and security in a mall environment. When considering the security of our shopping malls and retail spaces rarely are the perceptions of mall shoppers and visitors canvased despite the fact that their perceptions drive where they shop. To this end this research is of great value. Published in October, the Australian Strategic Policy Institute’s (ASPI) special report ‘Safety in Numbers: Australia’s private security guard force and counter-terrorism’ presents a compelling argument for better utilisation of private security in Australia’s counter-terrorism framework. There are some poignant takeaways for New Zealand here, not only in relation to the industry’s potential but also the barriers to closer partnerships between the industry and government. To this end we seek perspectives from NZSA CEO Gary Morrison. Throughout 2019 we will continue to publish updates and analysis on technological ‘disruptors’, such as developments in robotics, in the security industry. In this issue we take a fun look at the most recent addition to the Dubai police force’s patrol fleet: the Scorpion 3 hoverbike. Capable of 40 minutes flying time in drone mode, or 10-25 minutes when piloted, is it just one big gimmicky mirage or is it a true sign of the shifting sands of law enforcement tech? There’s plenty more news inside, with the latest from HID, Hikvision, simPRO, Dahua, Hills, NZSA, a first listing of international security events for 2019, and much, much more. Best wishes for a secure, safe and happy festive season!